We’re going to show you how to ace the IELTS Academic Writing task so that you’ll be able to craft a compelling, well thought out answer when you are faced with an IELTS Academic question asking you to compare and summarise data. After reading this article you’ll be confident reading and understanding data from a table and then you will be able to accurate describe it in an easy to understand manner that the IELTS examiners will love. And our interview is going to help you. After listening to Tish’s expert interview you’ll feel comfortable describing and summarising a table of data and figures. Let’s go through the main points that will help you on your road to IELTS glory in no time. This is a very important skill and is arguably the focus of the entire task. Look at the figures in the table and the tense of the data. Is it the past, is it the present or does it predict future trends? Also, look at the data and make a list of any vocabulary words that you will need to use to explain yourself effectively. This is a key tip! Data can be a mouthful to handle. Split the data into manageable pieces that you can group. That way you can explain it better because you can understand it better. In the above example, the data has been divided into two significant groups. This makes it easier to understand and describe. You can also look for exceptions in the data which is where something interesting happens or is something that stands out for you. 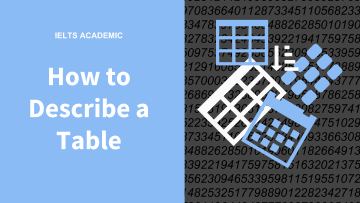 This helps you get started describing the data and the information you can see. You can see a model answer below to help you. 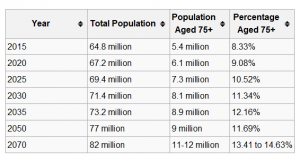 This table compares the UK’s 55-year projected growth of the number of people over the age of 75 with that of the total population. It is estimated that in the 20 years from 2015, the total population of the UK will grow by almost 10 million, from 64.8 million in 2015 to 73.2 million in 2035. The number of over 75’s will also increase significantly, from 5.4 million (2015) to 8.9 million (2035), which is an increase of nearly 4%. The estimated figures for 2050 and 2070 indicate that this trend will continue, and the total population will be as high as 82 million by 2070. Although the number of people aged 75 or older will remain relatively stable between 2035 (8.9 million) and 2050 (9 million), the number will continue to swell and by 2070 nearly 15% of the population (11 – 12 million) will be aged 75 or older. Overall, we can expect the number of people aged over 75 to double by 2070. How you structure your answer can help set the overall flow of your answer. Usually, two main paragraphs will be used so that you can describe each group of data. That means that one group of data would be described in one paragraph whilst the second group of data would be a new a paragraph. This keeps things organised and helps you keep track of your overall point. For example, the first paragraph could be comparing the data whilst the second paragraph is talking this in more detail, whilst a final summary sentence ties it all nicely. This helps you stay on track and easily cover all the IELTS bases too. Still not sure? Let’s go through an example. Introductory statement – explain what you are going to compare. Comparison – Describe and compare the data groups and any exceptions you can see. An overall sentence that ties everything together and talks about anything significant from paragraphs 1 and 2. Let’s see how it looks compared to a model answer. Let’s break it down some more, using the model answer above. Paragraph 1 talks about what the table shows and explains the groups that will be compared. In this case, it is two groups within the first group of 20 years. Paragraph 2 takes a closer look at the second group of 20 years and the data that shows. It also acknowledges the exception shown in the graph. The summary sentence describes something significant and relates to both paragraphs and ties everything together. 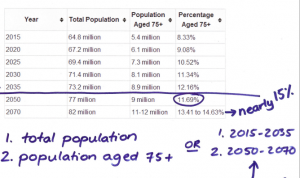 So, using our model answer above, this could be during the time period the amount of people over 75 doubled. Don’t include your own opinion or any information that is not asked for. Don’t include too many figures in your answer. Don’t forget to have a plan to structure the answer correctly. Use practice tests – the more experience, the better! Review sample essays, such as these here. Time yourself as you practice more and more. Try answering the question without using a dictionary. Use these tips in other questions, such as the academic task 1 questions. Warning: Use these in context. The figure for 1999 is almost three times that of 2010. The figure for 2011 is exactly four times that of 2010. It is clear that the figures between 2001 and 2010 are broadly in the same range. The figures between 1999 and 2000 are very similar to those of the prior year. The figures in column A and B are almost identical. Hello and thank you very much for these information, although i think it is not much sufficient unlike your other tutorials, but is good to start with.